When the trustees of the Social Security and Medicare programs release their annual reports, one of the first thing folks look for is whether the life of the trust funds that finance these retirement security programs have been extended or reduced. Well, in today’s release, the life of the Social Security trust fund was reduced by three years, from 2036 to 2033 (without changes to inflows or outflows, at that point Social Security would be able to pay about 75% of scheduled benefits). The date for the Medicare Hospital Insurance fund was unchanged. My CBPP colleagues take you through the relevant conclusions here and here. The key takeaway from where I sit is that these remain critically important programs whose future can and should be ensured by policy actions designed to enable both programs to continue to provide retirement security for generations to come. Such actions should be careful not to hurt the security of middle and lower income retirees. My point here, however, is a simple one regarding the exhaustion of the trust funds. The figures below show the exhaustion dates projected by the trustees over the last few decades. Note that they move around—a lot. 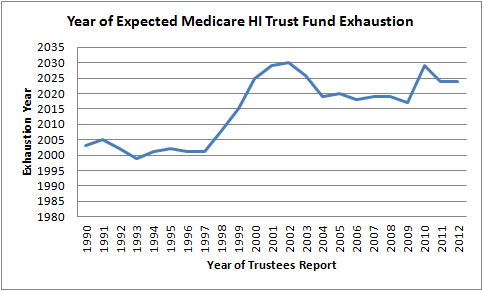 The Medicare hospital insurance trust fund has generally increased since the 1990s, as a function of legislative measures, like the Affordable Care Act, that extended its life (ACA added eight years to the HI fund). 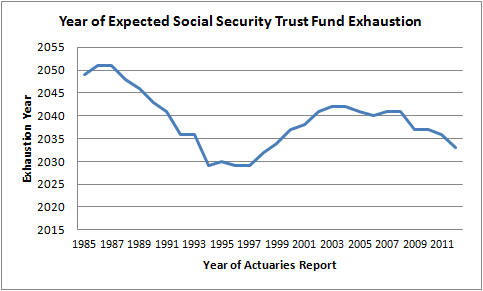 The movements in the Social Security trust fund have been more of function of the economic and demographic assumptions (e.g., increased life expectancy); they range from over sixty years—in 1985, they didn’t expect exhaustion until 2050—to around 20 years today. The figures are not intended to lessen the urgency of meeting the fiscal needs of these programs. But it is important to remember that these are forecasts based on a lot of moving parts, and the Great Recession is very much in play here. As with so much else in our fiscal and economic landscape these days, the best thing to do in the near term is everything we can to get the recession behind us and get back on a stronger growth path. Share the post "Trust Fund Exhaustion: A Moving Target"
3 comments in reply to "Trust Fund Exhaustion: A Moving Target"
I think ANY attempt to extrapolate 20 years into the future (let alone 75) is a fantasy. These estimates are very sensitive to small changes in the input assumptions, and we generally can’t predict those well for a year, let alone 20. It is particularly difficult to predict changes in the amount and price of health care spending. I wonder how the hospital insurance trust fund would look if we could match the performance of the German health care system? In practice, these are important and politically popular programs. I am sure that the policy makers of the future will find the money to keep them going. I thought the whole point of trashing the economy was to make things like SS less sustainable. All part of the bipartisan project to turn the US into Mexico’s poor northern neighbor and China’s labor pool. The Right, under Reagan and later Bush and B#%h, has put SS and medicare on a course that will eventually lead to their demise. Surpluses have been re-allocated to pay for fiscal follies and hair-brained schemes, then SS and medicare are blamed for the shortfalls in their budgets. Current thinking seems to go along with the directions past administrations have placed the country: that tax-cuts for the rich are set in stone, that we are a country that is in dire need to over defend itself against manufactured threats and needs a budget that reflects that paranoia. Therefore SS, Medicare/aide, education, the GI Bill, Food Stamps, the Post Office (and on and on and on) are wasteful and need to be cut back to preserve a blundering ideology that puts corporate greed above public good.